If you're looking for something as rugged as your FJ Cruiser to carry your supplies in, these can definitely handle that task. Daystar's Cam Cans are the aftermarket answer to the FJ Cruiser's lack of storage space. 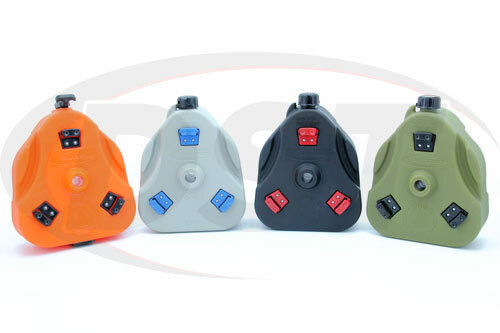 Each Cam Can is designed to carry different materials and each can is color-coded so you can easily tell them apart. The Black and Green Cam Cans are listed to carry up to two gallons of non-flammable liquids and are not intended for carrying drinking water. If you're looking for a safe way to transport water the grey Cam Can is BPA free and as such is designed for carrying potable water. 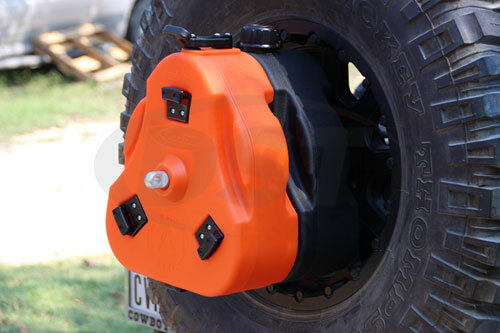 Finally, the Orange Cam Can is the trail-box, just throw whatever you need inside, tie down the strap, and you're ready to go. How much Liquid are we Talking? 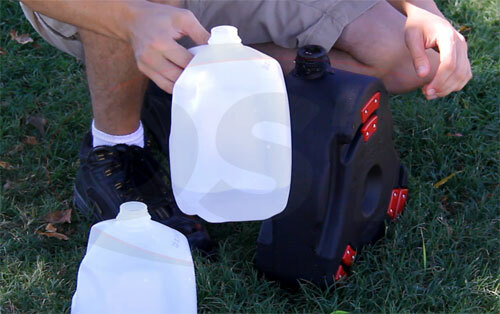 All of the liquid containers are listed to fit up to two gallons of fluid. We tested this limit and found that it was closer to 1.8 gallons. The liquid Cam Cans also come with a small spout. Just place the spout over the top, screw the cap back on, and you're ready to pour. Note that none of Daystar's Cam Cans are certified to hold fuel or flammable liquids of any kind. 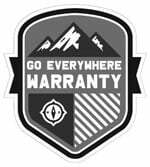 How big is the Trail Box? The various Cam Cans all share the same overall shape and size, but how does a "2-gallon limit" translate into something more solid? 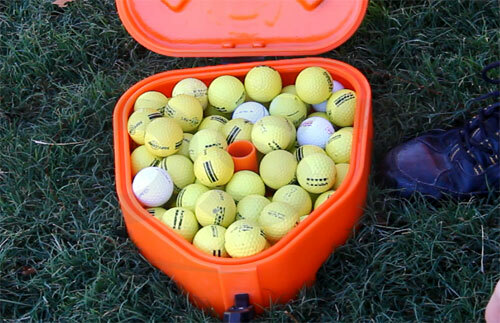 To give you a point of reference, we managed to snugly fit 70 golf balls into the trail-box. That's plenty of space to store the things you need to take with you on your next off-road adventure. 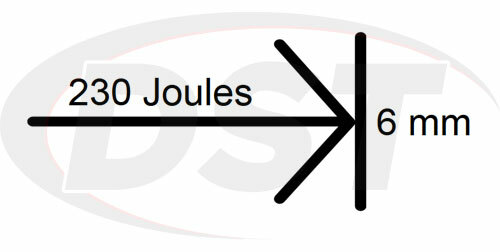 Made of a plastic that is resistant to both heat and pressure, these containers have been tested to easily withstand temperatures exceeding 140 degrees Fahrenheit and shrug off impacts of over 230 Joules focused into areas as small as 6mm. So if you're looking for something as rugged as your FJ Cruiser to carry your supplies in, these can definitely handle that task. 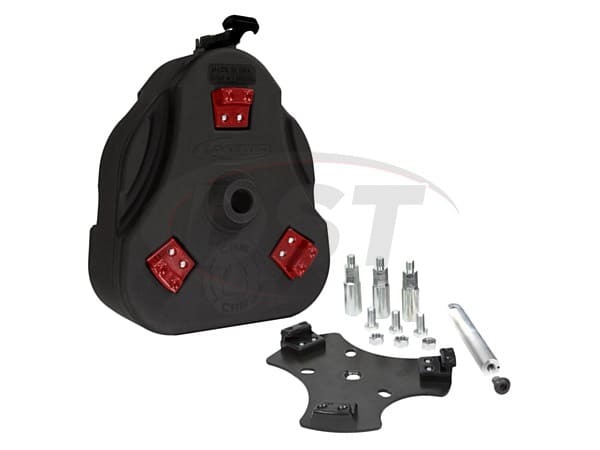 The Cam Cans are designed to mount to your spare tire studs, Daystar's kits come with a container and everything you need to get it mounted. Daystar also has the extended aluminum center pole you add to the mounting hardware and allows you to stack two Cam Cans in case you need more space. Each of Daystar's Cam Cans are capable of securely locking to either the mounting plate or another Cam Can. If you have any questions regarding the installation process check out our How-To Install Cam Cans blog post. Easy to install and out of the way, who wouldn't want to add the sturdy storage you need? 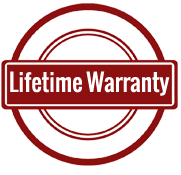 Backed up with Daystar's usual lifetime warranty handled in-house here at DST, we're confident you'll be more than satisfied with your rock crawler's newfound storage space.